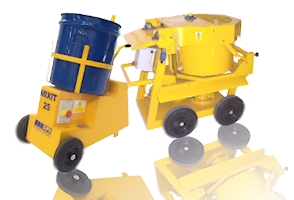 SPE manufacture & supply a range of mixing machines such as the popular Mixit 25™ and Mixit 60™ high capacity mixers as well as a large range of mixing tools, drums and paddles. The SPE Mixit 60™ - robust and reliable in heavy duty industrial applications. The SPE Mixit 60™ Pan Mixer is a forced action mixer designed specifically for heavy duty industrial applications. The mixing pan is driven through a gearbox by either diesel, petrol or electric motor. As the mixing head is lowered the machine automatically starts and then stops as the head is raised. A steel grill panel allows bagged material to be introduced throughout the process. Once mixing is complete, the mix can easily be emptied by using the tipping device. As well as petrol and diesel models, the Mixit 60 comes in 110v and 220v single phase electric versions and a 380/415v 3-phase electric version. The SPE International product range is subject to ammendment and improvement as a result of development and ongoing research. We reserve the right to alter details and specifications without notice. Copyright exists on all original design features. No content from this website should be used without written consent from SPE International Ltd..